Writing on the Wall is about all of the ingenious and fascinating ways that information has been transmitted over the centuries. 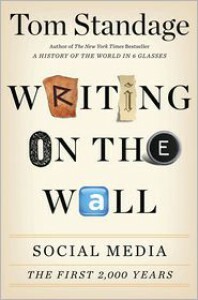 The author is able to draw surprising parallels between ancient media and the social media of today. These comparisons inform discussions of issues still relevant today, such as the question of whether communication at a distance makes us feel more or less connected to other people, and raises the question of how we’ll choose to use social media in the future. Writing on the Wall is very well organized, moving forward chronologically with each chapter devoted to an era dominated by a particular form of communication. These focused chapters allowed the author to share a ton of fascinating details about each era. For those of us who love fun facts, this is perfect. In addition to being enjoyable for their own sake, these little details really brought each era to life for me. For instance, did you know that lower class Romans often communicated via graffiti? And, thanks to the preservation of Pompeii, the author is able to actually share bits of that graffiti! I was amazed at how similar that graffiti was to things people might write today. For me, that feeling of “wow, they were just like us” is one of the best ways to bring history to life. The title of that chapter on graffiti in Pompeii? “Gnaeus Alleius Wrote on Your Wall.” Although these silly, fun, explicit comparisons to social media of today could have been too much, I enjoyed them a lot. They each made me smile and enhanced that feeling of being connected to the past. However, more even than just being enjoyable and amusing, these comparisons to the past gave the author a way to talk about issues raised by social media that are still relevant today. I particularly enjoyed the direct quotes from luminaries such as Thomas Paine and Cicero on social media in their time. This combination of fun facts and insightful ideas made for an interesting and thought provoking read.